Did tech play a role in winning Congressional and State campaigns? Flashback to the 2016 Presidential election aftermath. The new kind of messages that appeared in my inbox sought to connect tech talents with the progressive campaigns of tomorrow's elections. Initiatives such as Tech for Campaigns (header GIF) worked to encourage and help Silicon Valley's tech and digital talents lend their skills to build and manage the technological backbone of progressive candidate campaigns. Did this movement and, more generally, tech make a difference in the outcomes of the midterm elections? I asked Sayu Bhojwani, whose new book tells the story of progressive candidates. It certainly was all hands on deck, she said. But it is not clear whether tech was more than a fly by night thing. Although what worked very well in canvassing this year was the ability to engage voters through texting. Bhojwani said she had not seen such ability to contact voters at this scale. The success of engaging voters via texting depends on demographics, said a volunteer from the midterm campaigns. It depends on your voters having a cellphone and using text. This is the case in Maryland, but less so in states like Florida, for example, where the population is older (note that analysts say older voters have a higher turnout at the polls). If you are interested in data, tech and politics, join the Data Journalism DC Meetup. If you want to write or research on this topic, contact us! 1. The Syrian Democratic Forces (SDF) will announce the formation of an Armenian battalion. The unit is to consist of 50 fighters, Massis Post, an Armenian-American community newspaper, reported. 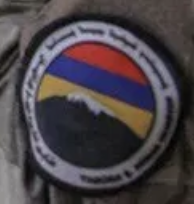 The region under SDF control in northern Syria includes an Armenian community. 2. Jordan-Syria ties stumble over fate of Jordanian detainees, Al-Monitor reported. The two countries exchanged parliamentary visits in what was seen as a positive sign of a warming of bilateral ties, late last year. This recent development reflects the reality that Jordanian-Syrian ties have a long way to go before normalization. 3. Islamic State kills regime fighters across Syria, Reuters reported. These attacks reflect that although the Islamic State lost its last territorial enclave in Syria at Baghouz near the Iraqi border last month to U.S.-backed forces, it still has fighters holding out in the remote central desert and capable of striking. Michael M. Gunter, a professor of political science who has written extensively on the Kurds told Shout News in an interview that the small remaining American military presence in Syria serves as a tripwire to deter any hostile intents toward the Kurdish-led Syrian Democratic Forces in control of northeastern Syria. "The U.S. will not leave the Kurds like Nixon and Kissinger did." American forces left in Syria serve as a deterrent should Turkey, Syrian regime forces and their Iranian allies backed by Russian airpower attempt to sweep through the territory that the Kurdish-led Syrian Democratic Forces control in northeastern Syria. A situation akin to the Cold War tripwire, where a small U.S. military force in Europe signaled America's commitment to an armed response to a Soviet attack. A miscalculation in Turkey's high risk adventure in Syria could reverberate in President Erdoğan's presidency. While there are no serious contenders today, a Turkish military embarrassment by in Syria could create an opening and lead to President Erdoğan's removal from power. "Syria's Kurds are much more noticeable today, and in a much better position than they were ten or twenty years ago, in a brighter position than they have ever been in modern times." "Turkey is the power Syria's Kurds will need to get along with", despite a rhetoric that portrays Turkey "as evil" relayed by the media in the West. Historically, in the region nobody is 100% enemy with each other. Today's loss are tomorrow's wins. This long view of the conflict is largely absent in the media coverage of the war in Syria, but key to understand the conflict. As the Syrian civil war enters its ninth year, the news media is abuzz with stories about President Bashar al-Assad's victory on the battlefield. Yet, Syrians in government-controlled territory are increasingly expressing discontent with the president as living standards in the country continue to deteriorate even as the conflict winds down, the Washington Post reported. Why it matters: Syria's president is at risk of winning the war but losing the peace if he fails to address a crippling shortage of fuel and electricity, provide jobs for the men returning from the front lines, and stabilize the Syrian currency. These challenges are compounded by inefficiencies and corruption amongst his government. A Damascus-based worker for a non-governmental organization in an interview for Shout! News claimed that Syrians feel they have been betrayed by their government. They acknowledge, however, that the central government's control of territory outside the capital has weakened due to the partial devolution of state and military power to local authorities as a measure to fight the war. Local warlords emerged as a result. "Military men don't behave like military anymore," the man said, who spoke on the condition of anonymity. Access to public services, as water, has been privatized by local strongmen and offered for a fee, he complained. He mentioned the example of a village he visited recently where public access to water is now run by someone close to the local strongman. "Today's living standards are worse than during the war," but Western countries' sanctions against the Syrian regime are also responsible for their deterioration, the man said. The ongoing conflict in Syria blends conventional warfare with social media manipulation operations to influence public opinion, according to research. The backstory: In January 2018, Turkey launched a military operation, code-named Olive Branch, in an around the northern Syria's city of Afrin. Key findings: There is a social media manipulation dimension to Turkey's war in Syria. The Turkish state or pro-Turkish state elements sought to influence public opinion on the conflict, backing up the Turkish state message in a computer automated manner and orchestrated campaign connected with the Twitter hashtag #operationolivebranch. The details: Research identified two ways the Turkish state or pro-Turkish state elements sought to influence audiences perception on Twitter. Automated Twitter accounts that pose as journalist and political account: Two high-volume automated accounts, one that poses as a journalist/blogger @PelinCiftek, and the other a political profile AkPartiNet. At the time of the research these two accounts were tweeting at a rate of 465 tweets per day (on a seven day average) and sharing the same content from twenty two other accounts. These two accounts at first glance have nothing in common nor appear to be connected. Yet, research found they were operating in concert with the identical volume, timing and tweets themselves. These two accounts were created within one month of each other, and have nearly an identical tweet to like ratio, and following to follower ratio. A network of automated amplifiers. These seemingly two unrelated (not directly connected) accounts are highly programmatic, and serve as the hubs of a tightly connected network that is amplifying the Turkish government message on the war in Afrin and other issues. This serves as an example of computation propaganda in action. Our research highlights how this network operates in a computer automated manner. Additional automated Twitter accounts amplifying the Turkish government's message about the war in Afrin and other issues. Research concluded these are likely government approved proxies or messengers (if not, it's highly improbable this content and network would exist) whose tweets are relayed by the two accounts above. At the time of the research it was noted that these ten accounts have a daily tweet average to classify them as cyborgs. The big picture: Turkey's military operation in the conflict in Syria is the first invasion by Turkish ground forces into a sovereign nation since the Cyprus conflict in 1974. Go deeper: A recent study by Oxford University shows widespread use of social media tactics by governments to shape public discourse and spread misinformation. This analysis was first posted on Medium, including research findings and methodology. 1. Christianity grows in Syrian town once besieged by Islamic State, Reuters reported, referring to Kobane, in northern Syria. The Evangelical movement is the beneficiary, not the traditional Eastern churches. Converts say the experience of war and the onslaught of the Islamic State claiming to fight for Islam pushed them to distance themselves from Islam. 2. Astana process moves forward: Kazakhstan will host new peace talks on Syria, backed by Iran, Russia and Turkey in effort to reach a political settlement for the conflict on April 25 and 26, The New Arab reported. The United Nations and Jordan are expected to attend as observers. 3. Gas shortage plagues Syria. U.S. sanctions are partly in blame, this thread on Twitter discussed. Yet, Reuters pointed to the halt in Iranian credit. Tehran is itself the target of U.S. sanctions reimposed since President Donald Trump withdrew from a 2015 nuclear deal between Iran and several world powers. 1. British taxpayers will pay for legal aid to Islamic State's bride Shamima Begum. The 19-year-old, who left east London in 2015, was stripped of her citizenship in February, after she was found in a Syrian refugee camp, the BBC reported. Ms Begum played an active role in the Islamic State's reign of terror as a member of the "hisba", which punishes those found flouting the group's laws on how to dress and behave, The Independent reported. 2. 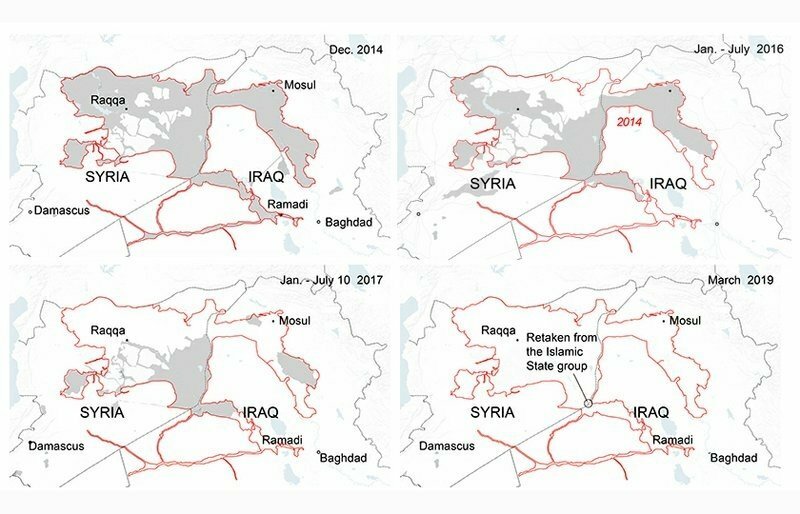 Associated Press published a map of the military campaign against the Islamic State from the group's greatest territorial gains in 2014. Gray shows areas occupied by the IS and allied groups. 3. Maronite bishops in Lebanon deplored the U.S. recognition of Israeli sovereignty over the Golan in a statement released at the end of the Bishops' monthly assembly, the Holy Land Christian Ecumenical Foundation reported. 1. A suicide bomber was killed after attempting to use a vehicle rigged with explosives to target a patrol convoy for the U.S.-led international coalition fighting the Islamic State in Syria's northeast, near the town of Shaddadeh in Hasakeh province, The Associated Press reported. This came three months after the deadly attack against coalition and U.S. troops in Manbij claimed by the Islamic State. 2. The U.S.-Turkey showdown continued since last week's decision to stop F-35 fighter jet parts delivery to Turkey in retaliation for Ankara's decision to move ahead with the purchase of a Russian surface-to-air missile system. On Monday, Turkish President Recep Tayyip Erdogan has reaffirmed his country's purchase of a Russian-made missile defense system, The Associated Press reported. 3. There is still no clear international policy about how to deal with the Islamic State militants captured in Syria. Western countries with citizens among the fighters captured by the Syrian Democratic Forces have been reluctant to repatriate them. As of late, Austria said it wants its citizens who have fought for Islamic State to be tried in U.N.-style tribunals in the Middle East rather than brought home for prosecution, Reuters reported. Women branded as "ISIS wives"--accused of being widows of Islamic State supporters, detained in a camp operated by the Syrian Democratic Forces said in an interview that they would rather go to Turkey than return home. Amongst the reasons invoked is the freedom to wear the niqab--face-covering clothing--that Turkey grants. Why it matters: As the Islamic State has been loosing its last territory in Syria, Western and other countries have been confronted with what to do with the thousands of their citizens who joined the Islamic State. Some governments are reluctant to take back home-grown fighters and their families. Western media have predominantly described "ISIS wives" as wanting to return home. This interview refutes that claim. This interview was conducted on March 8, 2019 by Mr. Ahed Al Hendi, an activist, writer and humanitarian, and former journalist with Voice of America, in the Al Houl detention camp in northern Syria. 1. Security officials in Afghanistan worry that Iranian-backed Afghan veterans of the war in Syria will one day become a secret army for Tehran in Afghanistan. Returning home as Syria's war winds down, these fighters face suspicion and fear. Iran paid, trained and armed thousands of Afghan Shiites to fight in Syria to defend its ally, President Bashar al-Assad, The Associated Press reported. 2. The Pentagon will sustain budget for arming the Syrian Democratic Forces (SDF) amid United States pullout. The Defense Department is doubling down on its support for the SDF in eastern Syria, as the Trump administration's top envoy for Syria confirmed that the United States would continue to keep a residual troop presence in the war-torn country for the foreseeable future and the Department of Defense decided to sustain $300 million in U.S. backing for the SDF, Al Monitor reported. 3. Syria's Druze feelings mixed about Trump's recognition of the Golan Heights. Some Druze residents of the Golan Heights protested the United States recognition of Israeli sovereignty over the territory, but others welcomed it, Al Monitor reported. 1. Kurdish-led Syrian Democratic Forces (SDF) call for international tribunal for Islamic State detainees. The SDF has detained some 1,000 foreign fighters, whose home countries are reluctant to take them back, BBC reported. Speaking to the BBC, one SDF official, Abdul Karim Omar, told the BBC they were struggling to cope with the thousands who emerged from the last Islamic State enclave of Baghuz, in the east of Syria. 2. U.S. Secretary of State Mike Pompeo is set to testify before Congress today. Pompeo first appears before the House Appropriations Subcommittee on State and Foreign Operations to discuss the Trump administration's FY 2020 budget request. Then the Secretary testifies before the House Foreign Affairs Committee where members will likely ask about the rationale behind the U.S. reportedly zeroing out stabilization assistance in eastern Syria. 3. Syrian Kurds demand autonomy before merger with Assad's army. Syrian Kurds will merge their forces into President Bashar al-Assad's military if he agrees to grant them some measure of political autonomy, an envoy in Moscow said, Bloomberg reported.